Musk thistle, a biennial or occasionally a winter annual plant, can reach a height of 6 feet or more and reproduces by seed. Plants have a large, fleshy taproot. Young plants develop into large rosettes of dark green, deeply lobed, spiny leaves that can be over 14 inches long. Leaves have a light yellow vein. Flowering plants produce single or multiple winged stems, each with smaller leaves and a single, terminal flowerhead. Each flowerhead is 2 to 3 inches in diameter and droops at first (giving the plant another common name of nodding thistle). The bracts surrounding each flowerhead are armed with stiff spines. The flowers are pink to rose-purple, maturing into straw-colored seeds with a white plume of soft bristles. Grazing Objective: Prevent seed production, reduce plant size and vigor. Growth Stage for Treatment: Graze musk thistle heavily during the rosette to bolting stage. Repeated grazing at approximately two-week intervals will be necessary to prevent flowering and seed production. May need to graze only once in a season if grazing occurs in the early flowering stage and site conditions limit regrowth. At least three successive years of grazing are needed to reduce populations. Potential Effectiveness: Grazing musk thistle reduces plant size, density, and reproductive efficiency. Sheep and goats will readily graze musk thistle; cattle will not graze musk thistle beyond the early bud stage. Grazing works best when combined with a fall herbicide treatment to control new seedlings and escaped plants. Hull, A.C Jr., and J.O. Evans. 1973. Musk thistle (Carduus nutans): An undesirable range plant. Journal of Range Management 26:383-385. Huwer, R.K., M.J. Neave, P.M. Dowling, W.M. Lonsdale, A.W. Sheppard, D.T. Briese, and D.L. Michalk. 2002. Integrated weed management (IWM) in perennial pasture using pasture and grazing management, herbicide strategies and biological control. In: J.H. Spafford, J. Dodd, and J.H. Moore [EDS.]. Perth, Australia: Proceedings of the 13th Australian Weeds Conference. Plant Protection Society of WA. P. 727–730. Kadrmas, T., and W.S. Johnson. 2002. Managing Musk thistle. University of Nevada Reno Cooperative Extension Fact Sheet FS-02-55. 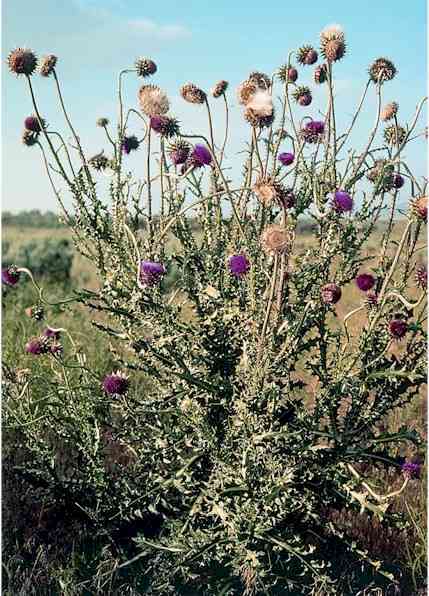 Available at: http://www.ag.unr.edu/wsj/Wayne/Managing Musk Thistle FS 02-55.pdf. Accessed 03 September 2006. Kristi, R.K. 2001. Competitive effects of cool-season grasses on re-establishment of three weed species. Weed Technology 15:885-891. Lamming, L. 2001. Successfully controlling noxious weeds with goats. Pesticides and You 21:19-23.